Alison Davis 1955-2013: Three years on Ali's message "continues to resonate"
Three years on Ali's message "continues to resonate"
Drawing attention to Ali on the third anniversary of her death, the leading pro-life media site LifeSiteNews says that Ali's message "continues to resonate after her suffering and death." December 2, 2016 (LifeSiteNews) – Suffering has value, meaning and a purpose, and despite the world’s attitude that it should be avoided and eliminated, suffering is actually good news for Christians. 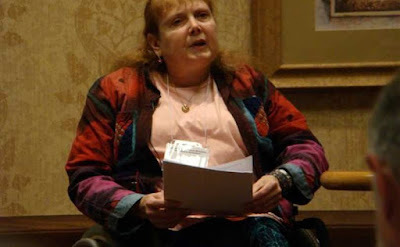 Alison Davis was a UK woman born with spina bifida who later developed other conditions such as osteoporosis, arthritis, and chronic obstructive pulmonary disease. She lived daily with extreme pain, and for many years she wanted to "end it all." Euthanasia Prevention Coalition Executive Director Alex Schadenberg echoed Harte’s thoughts on Davis. Her suicide attempts occurred in the years that followed the end of her marriage and she encountered other personal difficulties. It was then that she also began to seek peace through God. 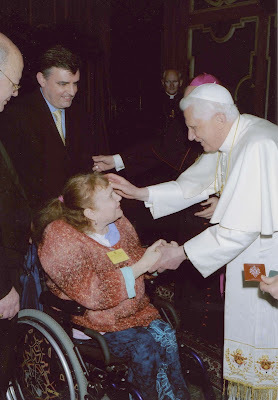 Christians are in danger of adopting the world’s attitude on suffering, Harte told LifeSiteNews. But even though it’s difficult, he said, suffering is something we should rejoice over, and this is the lesson that Davis’ life still brings. “For Alison, the time that she heard about offering up suffering became for her a source of joy. It made sense to her sufferings,” Harte continued. Schadenberg concurred here with Harte as well. Harte pointed out that so many think human life is just about experience, failing to understand the human person in terms of self-giving. Jesus Christ showed us this through his example, Harte said, coming to reveal the Father, and in doing so, leaving the image of himself on the cross — himself suffering. Although she made several serious attempts at suicide, she was saved by the intervention of friends, later changing her mind and recognizing the danger of euthanasia being legal and available to someone struggling as she did. “We are not made simply for the here and now, we are made for eternity and life with God,” Harte said, “and if we don’t take aboard the message of love, if we don’t live a life of love, if we don’t live the love that hurts, if we don’t suffer, then are we prepared for eternity with God?